First and foremost, visually Ghost Rider is an artist’s dream. There is so much that an artist can do. The fire is organic and you can show the torment behind his eyes. Rarely do you see a cover that does not have Ghost Rider in full flames. The flaming skull, the hellfire chain, and the flaming motorcycle (or charger) all are an artist dream. It is hard to argue that there is any hero or villain that looks better than Ghost Rider. It is a blessing and a curse. The trap is that Ghost Rider fans have high marks for the artwork. Just look at the very first Ghost Rider cover and realize that it was drawn in 1972 (Marvel Spotlight #5). 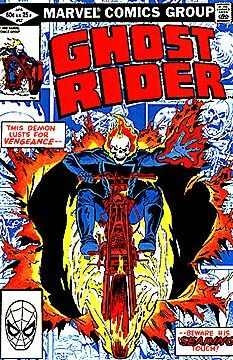 Every picture of Ghost Rider inside a comic demands cover quality pictures. Ghost Rider demands movement in only a way that speedsters can (Flash, Quicksilver). The writing is where Ghost Rider can have problems. When Ghost Rider is firing on all cylinders you find the story is strong. But what makes a strong Ghost Rider strong? When Ghost Rider is personal. The best stories are about Ghost Rider’s family. In the Johnny Blaze incarnation, you have Roxanne Simpson. Roxanne saved the Johnny Blaze’s soul when it was destined to be delivered to Mephisto. As a hint, do yourself a favor and always read the contract when dealing with ANY devil (be the one or his minions), And then when you are about to sign, DON’T. It never works out. In the Danny Ketch incarnation, you have Barbara Ketch. Barbara was shot in the chest by an arrow which sent Danny towards the path of the rider. Vengeance was required. Saving Barbara became an important theme during the early part of the series. She grounded Danny while the Spirit of Vengeance was pulling him towards violence. As for Robbie Reyes, he had his younger brother, Gabe. Gabe pulled all of the heart strings. Gabe is wheel chair bound, in the middle of a tough neighborhood in L.A. and has a relatively innocent look on life. For Robbie, he had a reason to live and a reason to do good. Gabe. So I wonder why the comics stray too far from these cast of supporting characters. Ghost Rider is at his best when he is surrounded and protecting those he loves. It is a personal mission of Ghost Rider to protect the innocent while dishing out Vengeance. In fact, in his Ghost Rider form, the personae become monosyllabic. There are only so many ways you can say Vengeance. And yes, I am aware Groot says a lot with just one word, but he also usually has Rocket Racoon to translate (and amazing artists that can say a thousand words with one image). Ghost Rider is first and foremost a personal comic. He has the power to destroy most comic heroes and villains, but rarely does he does so. Vengeance requires a personal stake. Vengeance without a connection is just a bunch of people fighting. I will say, that I wish I could say that I saw Ghost Rider being cancelled, but I did not. Sadly, my other Ghost Rider article was just a little too early.